Autistic people and those who love and support them are working hard to take a stand against negative and stigmatizing messages about the experience of being Autistic. It can be exhausting and can feel like an uphill battle counter the caustic vitriol that spews from powerful organizations such as Autism Speaks. A few weeks back, my friend, Lei Wiley-Mydske, and I live-tweeted as we watched Autism Speaks’ gross docutrauma (frickety frack, I love neologisms) “Sounding the Alarm: Battling the Autism Epidemic” which you can read about here and here. But fortunately there is a flip side to this negativity. There are films and voices and resources that are created by or involve Autistic people in an honouring way, and that give insight into the experience of being autistic. These contain important and helpful messages and information about the kinds of supports that are needed and how we might accommodate neurodiversity and disability, without the stigma of fear, burden and tragedy. 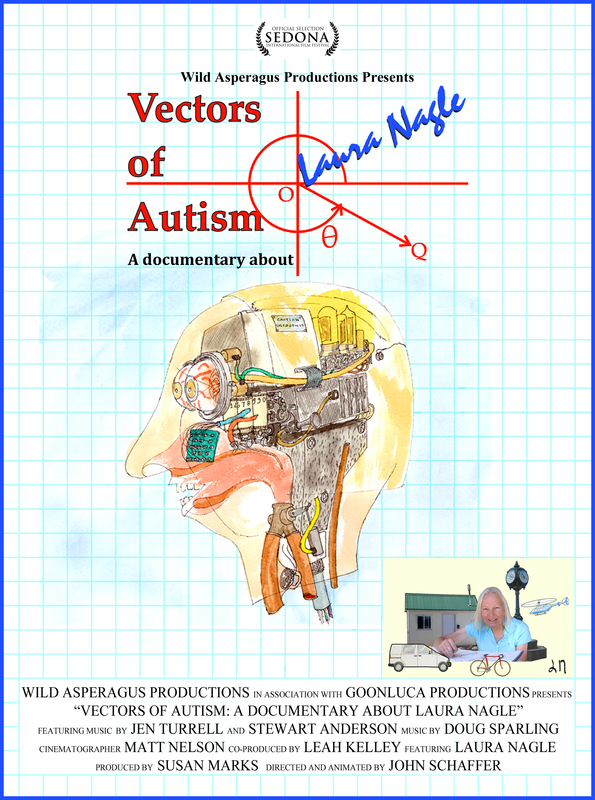 The film, Vectors of Autism: a documentary about Laura Nagle, is a wonderful example of this. It captures Laura’s story with sensitive insight, revealing her strengths and her challenges, and gifts us with Laura’s eloquent explanation of her experience of the world. I am of course very much in love with this film, and I will disclose my bias as I have been involved with this project for a number of years now. I will disclose as well that Laura and I have become close friends and so promoting this film is something to which I happily commit. Time and time again I have heard from people that they fall in love with this film, and I think they fall in love with Laura too. I know I did. 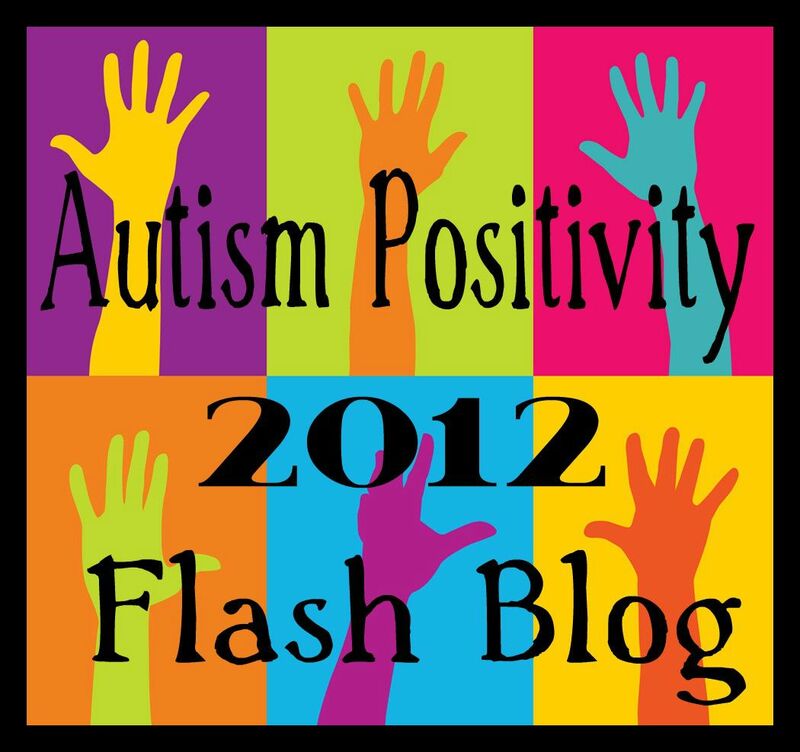 Vectors of Autism is currently available to view (for free) as part of the We speak, here, On-line Film Festival. And Lei and I were thinking that it would be really cool to live-tweet Vectors as a way to restore balance to the universe after our last endeavour, and focus on something marvelous. It is also a fun way to spread the word out about Vectors, because the film with the most views wins a prize in the festival – and frankly the prize money will allow Vectors to be entered into more festivals. And then our spark of an idea started to grow and my lovely friend and STAR of the film, Laura Nagle, agreed to join our flash-film-fest live-tweet as well. So this coming Sunday, August 10th at 5:00 pm, PDT, Laura, Lei, and I will be live-tweeting as we view the film and we would like to invite you to join us. If there are only the three of us… that will be fine. But if many people join us and this becomes a thing, well… the bigger the better as far as we are concerned because it is an opportunity to come together to take part in a positive action to signal boost this film. We intend to meet up on twitter at about 4:45 on Sunday to countdown to 5:00 and sync up our starting time. We are so excited and hope you will join us!! This entry was posted in acceptance, Autism, autism stigma, Autistic, Documentary, Laura Nagle, Snarfly, Vectors of Autism and tagged flash-film-fest live-tweet, Laura Nagle, Lei Wiley-Mydske, live tweet, On-line Film Festival, Vectors of Autism, We Speak Here Film Festival. Bookmark the permalink. Reblogged this on Walkin' on the edge. Count me in. Adding it to my calendar right now! 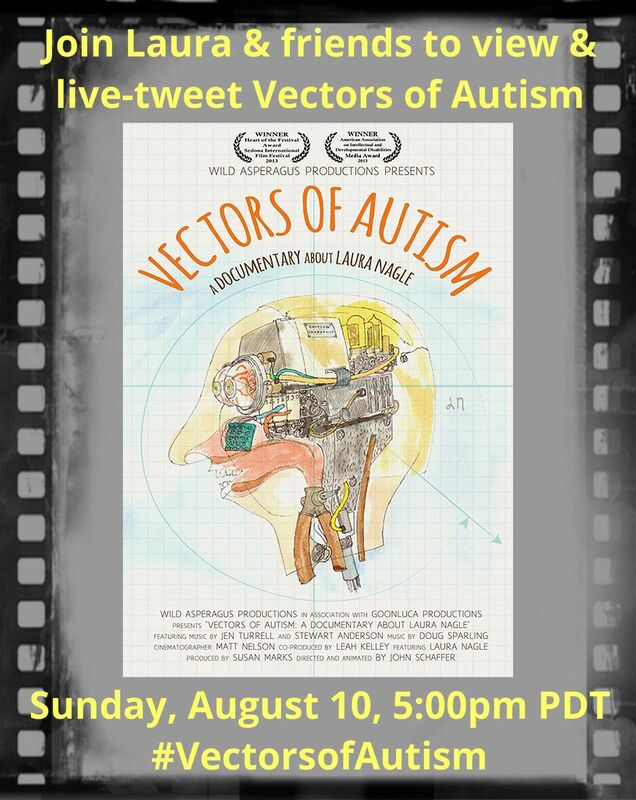 Several of us will be gathering on Twitter to watch Vectors of Autism together and tweet about it as a group, while we watch. Please join us!